"With the hiring of former White House officials Robert Gibbs and David Axelrod, MSNBC finds itself once again battling the perception that it is a staunchly "pro-Obama" network. On Thursday, Gibbs and Axelrod told CNN's Howard Kurtz that, though they spent many years fighting for and defending Obama, they will be independent-minded analysts." Independent-minded analysts? Yeah. Right. I'm sorry, but I've lost major respect for MSNBC on this one. At least before it hired Obama Administration officials it had some semblance of a claim of impartiality. But now? It is ALL THE WAY IN THE TANK for the Democrats. This is the type of crap we have grown accustomed to seeing on Fox News which lost its credibility years ago when it rushed to put elected GOP officials on the payroll. 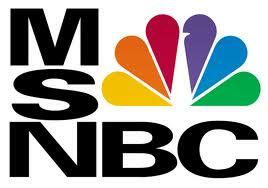 Now MSNBC is no better than Fox News (was it ever?). Don't get me wrong, MSNBC has always been "Left-Leaning," but there is a significant difference between being "Left-Leaning" and flat out hiring the political advisers of the current sitting Democratic President. They might as well put Obama himself on the payroll and keep a seat ready for him on standby during all of their primetime line-ups. I'm only half joking here. Look, folks, we live in an age where the reality of our reported news is continuously and increasingly subverted by the political persuasion of the so-called "news" organization doing the reporting. We no longer hear facts, we only hear opinions. If your job is to report the news, then your focus should be on doing everything possible to avoid even the APPEARANCE of impropriety with respect to your ability to do your job. The news is supposed to be impartial. By hiring people who are known to be partial, you call into question any ability that your news organization had to report the news factually and accurately without any partiality or bias. I don't need to know what Robert Gibbs or David Axelrod think about the issues of the day. I already know what they are about to say before they even open their mouths the same way I knew what Sarah Palin or Mike Huckabee were going to say on Fox News before they opened their mouths. And that, ladies and gentlemen, is the point.